Home » Blog » News » Why Does Everyone in McLean, Virginia Love Knockout Roses? Why Does Everyone in McLean, Virginia Love Knockout Roses? O’Grady’s Landscape has been in the residential landscape design and install business for 22 years, and in all that time our footprint of work has stayed constant. We work in McLean, North Arlington, City of Falls Church, Vienna, and Great Falls. When one of our landscapers meets with a potential client for a landscape design consultation, we work through the various categories of landscape install. The Knockout Rose gets an A+ in each of those categories! 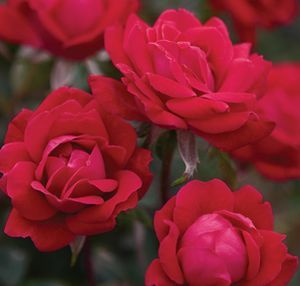 Other than needing a significant amount of sunlight, the Knockout Rose is foolproof. It’s inexpensive, it grows quickly, and it produces an enormous amount of color from Memorial Day to Thanksgiving. I cannot think of another plant which produces more color over a longer period of time. Knockout roses comes in seven different varieties, ranging in color from dark red through violet to pink, and there’s even a yellow knockout rose. If you are interested in bringing this beautiful flower addition to your home, O’Grady’s Landscape can bring our expertise and experience to your landscape. As we said, we’ve been installing knockout roses and rose gardens of all varieties in Northern Virginia properties since 1991, and we can take a look at your landscape to see how we can best implement these beautiful knockout roses into your outdoor space. If you are located in McLean, North Arlington, Vienna, City of Falls Church, or Great Falls, please give us a call at 703-533-5001 or request your consultation online to see how we can help. Mike has over twenty years of experience in the landscaping industry. He has been with O’Grady’s Landscape since 2000 as a talented landscape designer and manager who enjoys working with all of our customers to create unique landscapes.